Fabinho hopes that Liverpool have the right mentality to see through their Premier League title challenge and end a wait of nearly three decades. Liverpool have benefited as he scored his first goal in almost 18 months at Southampton and played a sublime role in the second goal against Porto. Liverpool pick up a famous 3-1 win over Bayern Munich at the Allianz Arena to progress through to the quarter-finals of the Champions League. Liverpool play out a second goalless draw in three Premier League matches as they are held by Everton at Goodison Park to relinquish top spot. Sports Mole previews Sunday's Premier League showdown between bitter rivals Manchester United and Liverpool, including predictions, team news and head-to-head records. Sports Mole looks at how Liverpool could line up for Sunday's crunch match with fierce rivals Manchester United as they aim to regain top spot in the Premier League. Dejan Lovren has still yet to train with his Liverpool teammates and will not be risked against Bayern Munich, according to a report. Ahead of the Champions League last-16 tie between Liverpool and Bayern Munich, Sports Mole selects the strongest XI using players from both sides. Sports Mole looks at how Liverpool could line up against Bayern Munich in Tuesday's Champions League last-16 tie. Sports Mole provides team news, predicted lineups and a full preview of Tuesday's Champions League last-16 first leg between Liverpool and Bayern Munich. 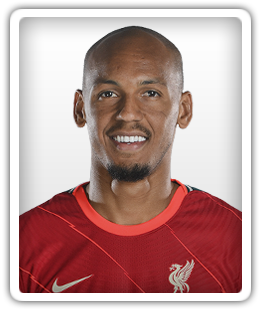 Fabinho has started five of the Reds' last six matches. The Reds reached the Champions League final last year and saw Philippe Coutinho join Barcelona in a deal worth up to £142m.